Contact Mark at Broman's Barn on 01787 211 115 or complete the enquiry form. Beautiful couple's barn conversion, complete with exposed beams and ample charm and character. This is a great place for a couple, who want to explore Mersea Islands wonderful Nature Reserves – you are on a farm that stretches down to the salt marsh nature reserves where seals bask. There are wonderful walks which will take you along the beaches straight from the very elegantly converted barn, next to the pretty pond. This lovely barn conversion is right at the end of Mersea Island and adjacent to the famous Nature Reserve of Cudmore Grove Country Park. Bring the dog along and enjoy the beauty of the salt marsh walks and Nature Reserves nearby ! Bromans Barn is very eco-friendly, with sheep’s wool insulation and ground heat source pump supplying hot water and under floor heating. There are also fabulous organic vegetables and herbs for guests to enjoy. Please visit the owner's website to find out more about the holiday cottage, amenities, surrounding area and places to visit in Essex. 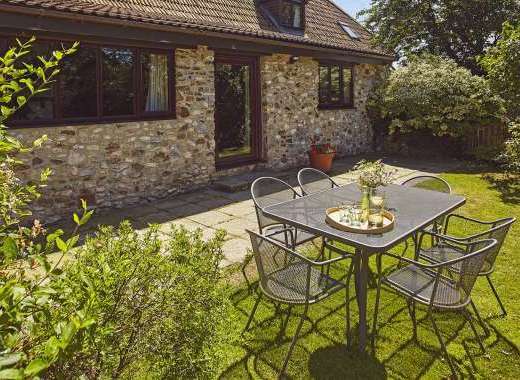 Garden: Bromans is situated in a pretty courtyard of a historic farm, with a beautiful pond next to the barn and a sunny, private patio area at the rear with large tubs of salads and herbs for the guests use. You can walk directly into the adjacent Cudmore Grove Country Park, which stretches down to the sea, from Bromans. The area is famous for it's oyster beds and wildlife; if you want to get completely out of the city atmosphere you could hardly find something more opposite and so close to London ! The cottage is adjacent to Cudmore Grove nature Reserve where there are some fantastic walks, exploring the shoreline which varies from cliffs to mudflat wilderness. The Roman City of Colchester is excellent for sightseeing, shopping and entertainment. Only 90 mins from London - it's a great weekend escape cottage. Annual Events: Various annual events and festivals throughout the year. Recommended Places to Eat Out: 'The Company Shed' - the place to go for wonderful seafood meals; just bring along your own bread and wine and feast away ! A must-have for all you seafood lovers.